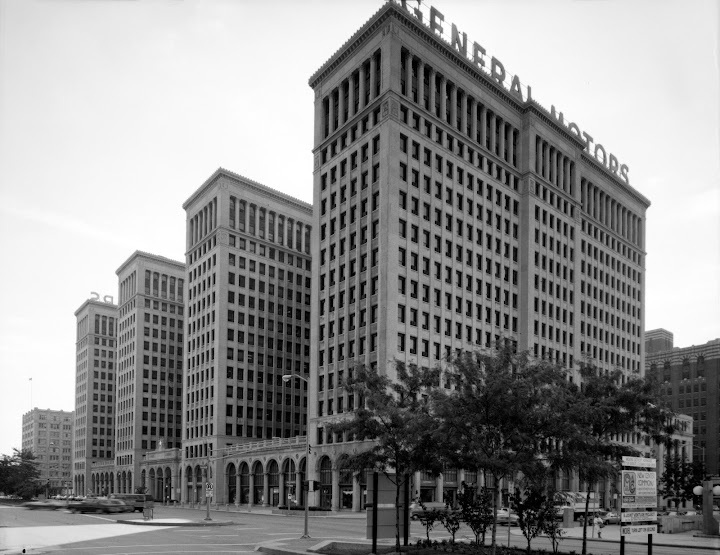 In spite of the RenCen’s close association with General Motors, it was actually commissioned in 1970 by cross-town rival Ford motor Company. Ford occupied and refined the complex from 1977 until it was purchased by GM in 1996. GM then undertook a $500-million restoration and upgrade of the facility. Until GM bought the RenCen, their world headquarters were west of Detroit’s Woodward Avenue in what is now known as Cadillac Place. This ornate, 1920s landmark consisted of four large office wings. It was quite impressive in its own right, and many historic photos feature this complex when illustrating GM’s heyday. The large “GENERAL MOTORS” signage stood as a symbol of American success. The RenCen is the glue that holds downtown Detroit together. Don’t let the news reports fool you, this is a pretty cool place to be. An above ground train, called the People Mover, connects the RenCen to other shops, businesses, hotels, and casinos throughout Detroit’s busy downtown. For only 50-cents, you can easily make your way around the city, and there is always something to see or do, day or night. Once inside the RenCen, a beautiful showroom reminds you that, “hey, this company really does build some nice vehicles.” Most new GM cars and light trucks are on display in the showroom, including the new Corvette Stingray, the Chevy SS, and all the new Cadillac models. All GM divisions are represented. And when you see them in a setting like this, it’s hard to imagine that people doubt the products that come from this company. I’ve been a GM fan through good and bad, but this right here is a good time. When you walk around and see the shops, you also see GM employees scrambling around with brief cases and stacks of paper, working hard to put the once unstoppable GM back on top of the automotive world. They hammer the mantra home that GM is there to build and sell the best vehicles in the world, and the people that work in that building believe that completely. I spent a lot of time in meeting and conference rooms while I was there. That’s pretty typical with other jobs that I’ve had, but there is a different vibe here. The attitude is more serious. The people are smarter. This is a group that works on a different level than anywhere I’ve worked before. If you’re going to succeed here, you had better bring you’re A-game. While I was there, I stayed in the Marriott Hotel that is part of the Renaissance Center. I was on the 35th of 73 floors, which had a view of Windsor Ontario, Canada. The rooms and hallways are decorated with vintage promotional photos of GM vehicles. I’ve been to Detroit many times, but never had a chance to stay there. Now I can cross that off my bucket list. Cool stuff. Between meetings, I snapped 82 pictures of the vehicles and other things around the GM RenCen. As usual, you can check them out in the slideshow below, or click this link for a nicer version. Kansas City Misses you already ! keep the posts coming, craig. we are living vicariously through you! (re: the photos... you really can't help yourself but take a few, can you? well, it wouldn't be the same without 'em.) thanks for update! - mike t.
Great Read, Congrats on your new position. Here at Damaged Cars, we have a rep who worked with GM and there Marketing Department. By far some amazing Photos in that Gallery.